San Francisco is a city long associated with rights movements, idealism, and rallies for peace, making it a useful backdrop for X-Men: Destiny. But Silicon Knights isn't planning on a Summer of Love when the game arrives this fall. Shown off at a preview event Wednesday at Comic-Con, Destiny will present three different stories for a player to choose, advancing their characters through individualized narratives and choosing powers and abilities to fill out their development into entirely new super heroes. "It's not good and evil the X-Men universe; it's always about making morally ambiguous choices," said Silicon Knights' Julian Spillane, an avowed X-Men fan. Destiny will therefore have a variety of outcomes that arrive through the choices a character makes and who he or she aligns with, reflecting the X-Men's idealistic perspective and the Brotherhood's darker, more Darwinian world view. Destiny is a splinter of the X-Men continuity, putting the mutants in San Francisco following Professor X's death at the hands of Bastion. San Francisco has offered amnesty for mutants as the Purifier movement advances globally. The story begins up on San Francisco's Embarcadero, with Cyclops, Emma Frost and San Francisco's mayor making a joint appearance to unveil a giant peace memorial which is, quite inadvisably, made of metal. A catastrophic attack of unseen origin unfolds, laying waste to the Market House. At this point the player charatcter's powers manifest themselves. You get to pick one of three bases: density manipulation (think Colossus), energy projection (think any sort of blaster character), or dark matter (think Nightcrawler). From there, the adventure proceeded through the ruins, with the player encountering roving bands of Purifier thugs, all waving stun wands, You dispatch these with the assistance of well-known mutants like Iceman and Quicksilver, with RPG Q&A conversations after the encounters helping to fill out the story. Spillane said the game has three scripts, to account for each main character, and though the stories have the same plot turns and objectives, they will reveal details and explore backstories unique to all three. Aimi Yoshida is the stranger in a strange land, a 15-year-old sent to America from Japan by her father, who also is a mutant. Grant Alexander is a college football player from Georgia, someone politically unmotivated and something of a party animal. Adrian Luca, the son of a Purifier, is the most conflicted, beginning as a highly motivated hate activist who becomes the target of his father's agenda. The combat I saw definitely marked the game as a brawler. Battling as Grant with density manipulation, his arms became enormous, rock-like pistons that smashed foes and blocked attacks. The brawling used standard light/heavy attack buttons and allowed for some combinations and finisher moves, to be chosen and placed into a power tree. I did not see the X-Gene power specification in action, as the demo ran through the tutorial introduction to the game. The map proceeded in linear fashion and bad-guy spawns unfolded conventionally. 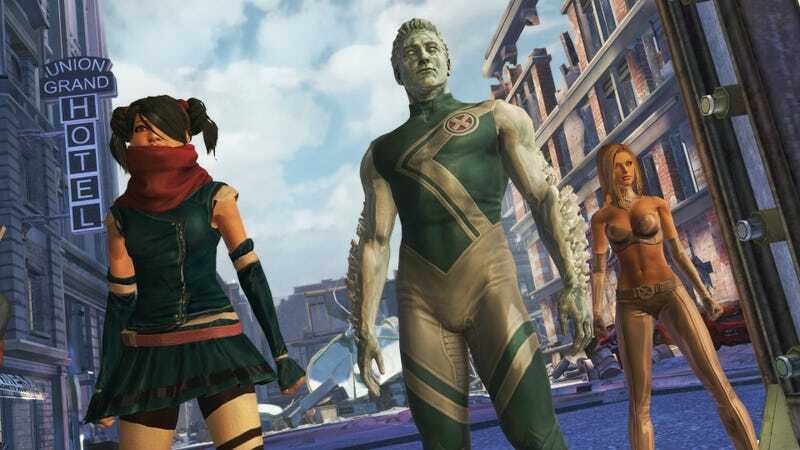 The game has echoes of the well received X-Men: First Class film from earlier this year, something that makes Spillane optimistic for the response to this game. "The story of the X-Men has always been an allegory for rights," he said. "When I see that we've hit these tenets (seen in the film) I feel we've done something that's really true to the brand."